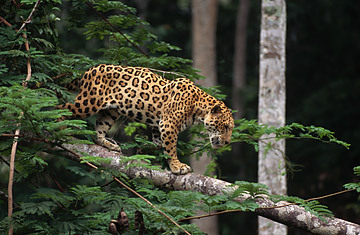 As the human population has grown in the Pantanal, the vast wetland in central Brazil, people and big cats  namely the South American jaguar  are encroaching increasingly on each other's territory. When conflict occurs, as it inevitably does, the cats are usually the ones who lose. This is the kind of situation to which conservationists might have responded by cordoning off protected habitats and reserves  building a fence, in effect, between the wild animals and the people. But in the Pantanal, and in much of the rest of our once wild, once underpopulated world, total separation is simply not a sustainable option. That's especially true for jaguars and other big cats, which need a lot of room to roam, far more than could be fenced off. "The big cats' territory is crossing over to the human landscape," says Alan Rabinowitz, a renowned conservationist and the president of the new wildlife group Panthera. "At its root, we have to get people to be able to live with the big cats." For Mt. Sinai, which has made global health a priority for its medical students, the Panthera project presents an opportunity to explore another consequence of the increasing proximity of animals and people: zoonotic diseases, which can pass back and forth between wildlife and human beings. Several major human diseases have originated in animals, including Ebola (which began among primates in Africa) and avian influenza (which started in wild and domestic birds in Southeast Asia, but has also infected big cats). As human beings, wild animals and domestic animals begin to live in closer and closer to one another, the chance of pathogens jumping  and amplifying  between species will only increase. Sinai's researchers will be able to monitor the population in the Pantanal for zoonotic diseases, providing a needed early warning system for new and emerging pathogens. It will also be a valuable learning experience for Mt. Sinai's students. "We see a really close interface between the health of human populations and conservation efforts," says Paul Klotman, chairman of the department of medicine at Mt. Sinai. "This will allow us to do surveillance to look for potential pathogens that could be important for both wildlife and people." The Panthera-Mt. Sinai collaboration is atypical, but not for long; it is the shape of things to come for conservation work around the world. Critics who accuse environmentalists like Rabinowitz of protecting animals at the expense of human well-being have got it wrong. Wildlife experts are aware that in a world of 6.7 billion people and counting, the only conservation efforts that have potential  and the only plans that will be truly sustainable  are those that benefit people as much as lions, tigers and bears. "Big cats won't survive unless people want to live with them," says Rabinowitz. "You have to show how they can benefit." In the 58,000-sq.-mi. (150,000-sq.-km) Brazilian Pantanal, there should be room enough for both. See TIME's graphic "Animals Under Seige."